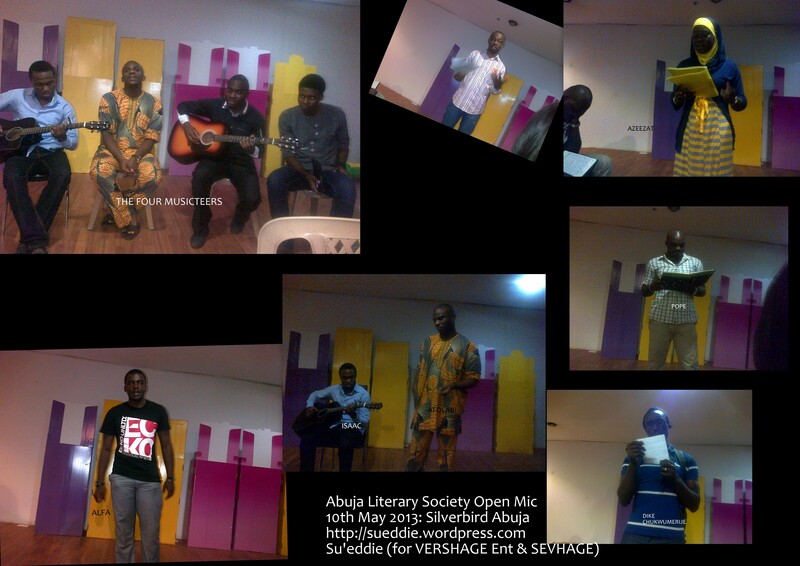 It was the Open Mic session of the Abuja Literary Society and yup, I had to be there. First people I noticed coming in were ElNathan John and Dike Chukwumerije. Okay, this was going to be fun. Usual hi’s to friends and acquaintances and I got to my seat. Smiling. This was going to be fun. The last time I had been at any ALS event was with Chuma Nwokolo Jnr when he had had his reading. That had proved a most entertaining evening. After some time we got started with general introductions. I noticed immediately that there were lots of fine voices – trust me to catch that. Also noticed that there was this fine lady beside me who said something about being here in the country for one thing or the other. The MC (the Bookman) started the discussion session. We settled to discuss the topic ‘Excessive Force of the Military in Fighting Boko Haram‘. The talk went far beyond that o… Of course, I wouldn’t be boring you with that, so cool! I can only say that if you want a deep flow on the topic, you can still make out time (if you are in Abuja) to come for the ALS open mic session on 14th June 2013, same venue. We were promised that military experts would come to give their thoughts too so that we don’t keep moving about with our professionally unprofessional analysis… Hee hee hee. Oh well. Next, Azeezat read a short story ‘Apprehension’, set in a town near similar to Jos. Well, Jos came to mind. It was about someone running in a time of crisis, hiding, noticing evils and falling… First draft. Most of us agreed that it could have been better. Adeyemi read ‘Cheeter‘s buzz’, a poem which some people had some time fitting into the right genre. He wasn’t conversant with the poem and it could have been written better, and performed more beautifully. I have a feeling there’s more to that particular piece… Removing some forced rhymes, overt biblical allusions that were plain and the like. Elnathan John commented of the poem that the poet took the name of the Lord in vain! Hee hee hee. Oh well. Enough said. Before the audience or I knew it, I was sitting again. Wow! Felt good reading that. Some people mentioned that I should join the slammers (performance Kings). I smiled. Well, compliments that would leave anyone fulfilled. The reading continued. A hip-hop poetic performer, Ogo, read ‘Pure’. The banker rhymed on like Jay Z and not a few ladies made catcalls… Na wa o! I need to learn some romantic rhymes too! The Musicians took over. Afolabi and Isaac came on stage. Isaac was on the guitar, while Afolabi breathed lyrics into the air that had me change my camera from still shots to video mode. The song was ‘Trueness’ and the rendition truly from the soul. It came out lovely. Some people noted that Afolabi held back and could have done better. Left a few people behind me and myself too wondering what they meant… This guy was sooooo it. Wow! You should have heard him. It was fluid and to think it was without effects or anything? C’mon!! A lady, Kelechi read ‘Sweet Seeder’ (a story/article/narrative/instruction). Suggested that she work on making it one. Material there but too undefined. There was a poem read by Banji and Egbuche Pope read a long undefined piece too, titled ‘Its 4pm’. He was told to rework it. There was a short story read by … Another musical presentation was done by Afolabi and three other friends. Hmm. Need I say more? I respect the guy jare! Meanwhile, there was a journey of some two hours to get to. Home called and more activities. Oh well. Nice post. It’s great to read about other open mics. Thanks for the shout out to Open Mic at Village Books! Learning to follow Open Mics Laurel 🙂 … Well done on all the work at Village Books! I didn’t go to them regularly until the one at Village Books, and now I am so glad to be involved. As you know, you never know what to expect and people read amazing work. Thanks for the good words! hehehehe, looks like another one signed sealed and delivered Su’. So so talk SU’ I CAN’Y WAIT!!! Beautifully written. ȋ̝̊̅ would have loved to be a part of it. Thumbs up, the imagery was superb!